Since its creation, the European Union (EU) has been a participant in the activities of other International Organisations (IOs) or has been working together with them. Still, little information is available on what this long-term involvement with(in) IOs means for International Relations and European Studies. Why has the EU been involved with(in) IOs on such a long-term basis? How? With what impact? These three key research questions are addressed in this innovative volume, in a bid to explore the continuity of EU action with(in) IOs. While written by a diversity of authors (from European Studies or from International Relations, Europeans or non-Europeans) and from a diversity of disciplines (in particular Law and Political Science), each chapter of the volume elaborates on three common political concepts derived from three-fold questioning: commitment (for the why question), consistency (for the how question), and effects (for the question of impact). 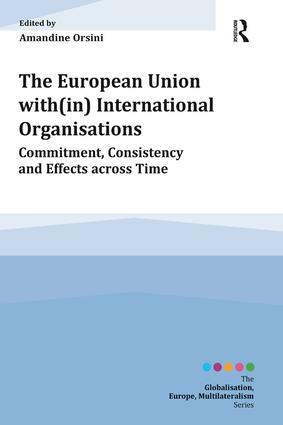 Consisting of a two part structure, the book is focussed in Part I on more general trends of the EU’s long-term participation with(in) IOs - with contributions by A. Wetzel, P. Debaere, F. De Ville, J. Orbie, B. Saenen and J. Verschaeve, and P. Nedergaard and M. D. Jensen - and in Part II on more precise case studies on labour standards, public services, flexicurity, human trafficking and security - with contributions by R. Kissack, A. Crespy, E. Xiarchogiannopoulou and D. Tsarouhas, B. Simmons and A. DiSilvestro, and N. Græger. Highly useful for students, academics and experts, this volume combines a clear and easy-to-use framework with new empirical data. Amandine Orsini is Professor of International Relations at the Political Science Research Center (CresPo) of the Université St Louis in Brussels, where she teaches International Relations and International Organisations. Established and edited by Professor Mario Teló (ULB & LUISS) and Frederik Ponjaert (ULB & Waseda), the Institut d’Études Européennes at the Université Libre de Bruxelles (IEE-ULB) sponsored GEM Series published by Routledge brings together original peer-reviewed publications on: "Globalisation, Europe, and Multilateralism"
Each volume included in the series delves into a given dynamic shaping either the global-regional nexus or the role of the EU therein. Accordingly, the resulting international and interdisciplinary publications offer original insights into: globalisation and its associated governance challenges; the changing forms of multilateral cooperation and the role of transnational networks; the impact of new global powers and the corollary multipolar order; the lessons born from comparative regionalism and interregional partnerships; as well as the distinctive instruments the EU mobilises in its foreign policies and external relations. The GEM Series’ edited volumes, monographs and textbooks all aim at contributing to further innovation in the fields of European Integration and International Studies. An International Advisory Board with leading scholars from across all five continents further supports the series with input and guidance.